IndonesiaTravelVisit.com | Close look at ceramic handicrafts making that is done from generation to generation while hunting beautiful hand-made collections produced by skillful craftsmen. In the Dutch colonial time, in one of the areas at the southern part of Yogyakarta there was a shocking and even threatening occurrence with the finding of a dead horse owned by a Dutch detective on a rice field of a villager. Being afraid of punishment, the villager gave up his land ownership and did not acknowledge his land anymore. This was followed by other villagers. This given up land was then possessed by people of other village. Having no more fields to cultivate, the local people ended up with becoming ceramics craftsmen to make toys and kitchen sets until now. This was revealed in an interview by Prof. Gustami at all with local elders in 1980s. It is that area that we know it as Kasongan until present time; a village in Kajen hamlet that is situated in low mountains with limestone soil. It takes 15-20 minutes drive from the city center. 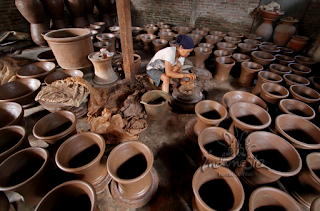 Kasongan village is the dwelling place of kundis, which means earthenware jugs and later refers to people who make any earthenware jug-like as kitchen tools and ornaments. "Beginning from our ancestor's habit to knead clay that turns out not to break when it is united, and begin to make some functions for kid toys and kitchen tools. The habit was then descended to current generation," said Giman, one of the workers in Loro Blonyo workshop. Visiting Kasongan village, the tourists will be welcomed warmly by local inhabitants. They may have a look the showroom crowded with ceramic handicrafts. If they are interested in seeing the ceramics making, tourists can visit some ceramic galleries that produce the special handicrafts at site. The processes are material kneading, shaping, drying that takes 2-4 days and burning before finally being finished using wall paint or roof-tile paint. Working collectively, a gallery is usually a family business run from generation to the next generation. Even though ceramics making is now involving neighbors of surrounding dwelling place of the gallery owner, the family is still responsible for material selection and production monitoring. At the beginning, these ceramics did not have style at all. The legend of the dead horse, however, inspired the craftsmen to create horse motifs on many products, especially the horses carrying earthenware goods or roof-tiles complete with bamboo basket placed on the horseback, in addition to frog, rooster and elephant motifs. The entering modern influence and culture from outside through various media and the first introduction of Kasongan to public by Sapto Hudoyo around 1971-1972 with artistic and commercial touch and commercially sold in major scale by Sahid Keramik around 1980s enables tourists to see various ceramic motifs. Tourists can even order motifs to their like such as peacock, dragon, rose and others. The types of self production include so many forms. They do not only make kid toys (sounding toys, frog, and money box) and kitchen tools (kuali, pengaron, kendil, dandang, kekep, and others). 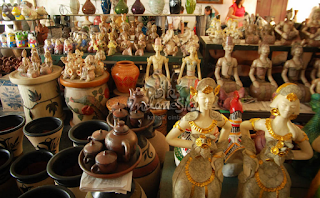 Entering the gate of Kasongan village, you will see ceramics galleries that sell ornamental items alongside the street. The forms and functions have varied, from small ashtray to flower vase as high as one's shoulder. The ornamental goods either have functions or merely as ornament. One of famous ceramic displays is statue of a couple sitting in polite position. This statue is named Loro Blonyo at the first time by Loro Blonyo gallery owned by Walujo. This statue is adopted from a bridal couple owned by Yogyakarta Kingdom. In Javanese language, Loro means two or a couple, while Blonyo means to be made over through bathing and making up. "The real meaning of Loro Blonyo, however, is still in question among craftsmen in Kasongan," Giman said. The existing belief of Loro Blonyo statue that brings luck and perpetual family life when located at home, as Giman told IndonesiaTravelVisit.com, brings positive impact on the sales of this statue. Some foreigners place order of special statues in certain forms such as dancer, guitar player, models and others. The clothes are not standard Javanese anymore; special clothes of some countries are adopted; statues in Balinese and Thailand clothes are found most. Some ceramic galleries sell this statue in different styles. Since the end of the twentieth century, after economy crisis hit Indonesia, tourists may find other products other than earthenware goods. The entering of new comers who open galleries in Kasongan is one of the influences. They sell local products such as handicrafts from coconut tree, dried plants or shellfish. "Business catches up with trend and development, looking at opportunities," Giman adds. Earthenware goods, however, are main means of livelihood of local community. "We have the gift for that; furthermore we have no other skills. Most of us do not finish Senior High School. Only few of them," he adds. Ceramic handicrafts with various forms and modern as well as artistic motifs and other handicrafts are magnets of Kasongan at present time. Kasongan is a tourism place full of stories and beautiful goods resulted from skillful hands of local community to knead clay. 0 Komentar untuk "KASONGAN , Hunting Ceramics in Kundi Community"